Round 6 of the championship taking place in Plovdiv brought a solo leader. 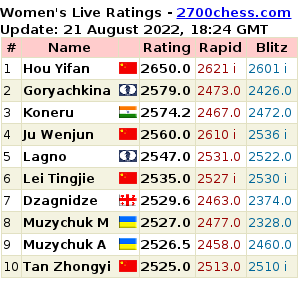 Valentina Gunina, who has won the EIWCC 2012, beat the rating favourite Nana Dzagnidze of Georgia. 20.gxf3?! More preise was 20.Rxf3 with a considerable advantage in all variations - for instance, 20...Ne5 21.Qxe5 Rxe5 22.fxe5 g5 23.Bxg5 hxg5 24.Rxf6. 20...Re8?! Correct was 20...Rcc8!, preparing c5 square for the knight, the position stays unclear. 21.b4! 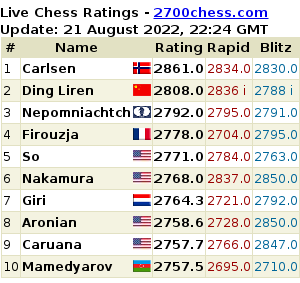 Rh5 22.Bg3 Nf8 23.f5! N8h7 Black chose a slow and hardly a realistic plan for the counterplay. 24.c5 Interesting is 24.h4!?. Now Gunina leads with 5.5/6 (after a first round draw she won five games in a row). Natalia Zhukova of Ukraine had a chance to reach the same result after today's round. The former European champion missed an opportunity against another Russian player Olga Girya . the game finished in a draw. 39...Qe7? The most probable way to victory was 39...h5 (threatens 40...h4) 40.Nxd3 Rh1+ 41.Kg3 h4+!, then 42.Kf2 Rhf1+ 43.Ke2 Qh5+ 44.g4 hxg3# or 42.Kxh4 Qe7+ 43.Kg3 Qxd6. 40.Re6 Rh1+ 41.Kg3 Qxb4? After this move however the draw becomes inevitable. 42.Re8+ Kh7 43.Bg8+ Kh8 44.Be6+ Kh7 45.Bg8+ Kh8 46.Be6+, the draw. Lela Javakhishvili converted her extra pawn in the endgame against Socko and joined Zhukova. Thus the leader has two nearest rivals, other ten participants are half a point behind. The world champion Hou Yifan defeated her compatriot Zhao Xue in round 4 of the Women's Grand Prix taking place in Lopota, Georgia. Now she is back to solo lead with 3.5 points out of 4. In Round 2 of the ACP Golden Classic taking place in Bergamo, Russian GM Nepomniachtchi was defeated by Wesley So of Philippines. Baadur Jobava went on with a rare line in Sicilian against Emil Sutovsky. Earlier it was mostly played by IM Eduardo Limp. Sutovsky sacrificed the pawn after the well examined theory. Although the energetic attack brought White a point, it is probable that Jobava could escape several moves before he resigned. In Round 6 of the Women's Grand Prix Hou Yifan gained an important win over her compatriot Ju Wenjun.